If you have the unlocked Oneplus one and are enjoying some rooted goodness on your phone. Yu then realise that you are facing some issues with the phone or using some custom ROM on your phone and go back to the Stock version of Oneplus One latest update CM12S-YNG1TAS2I3. This guide is for you, with the help of this guide you can easily install the stock version on your phone. Most of the user are on the Custom recovery and can’t able to flash this update on your phone or getting some errors to install the latest update. With this method, you easily flash the latest build of CM 12s on your phone. This guide will work on any ROM with Custom recovery or stock recovery, In this guide we’ll show you how to flash the latest build on your phone with ADB commands and one of the easiest way to go back to the stock ROM. It’s recommended that you have adb/fastboot in your System Path. This makes it easier to run commands to install the ROM. This will reset the phone back to it’s out-the-box state, so do take the full backup of your phone and save it in some safe place. Step 1. As we mention above to follow this guide you need to unlock the bootloader. Check our guide here how to unlock the bootloader on Oneplus one. Step 2. To Run the ADB commands on your PC, you need proper USB drivers and ADB files. Read our guide here how to install Oneplus One USB drivers and how to setup ADB/Fastboot files on your Windows PC. Once completed you will see fastboot/adb folder on your C drive (C:\adb). Step 4. Unzip the file you downloaded and move all the files on the ADB folder that you created in Step 2. Step 5. Now boot your phone in fastboot mode. Switch off your phone and press power + volume up to boot the phone. Step 6. Connect your phone to the PC with USB cable and open a command prompt from within your adb/fastboot folder (shift + right click, select open command prompt here). Step 7. Now run the following commands one by one on the command prompt window. Step 8. Now the Flashin process is done, reboot your phone by entering this command. Step 9. Now your phone will reboot and the first boot will take some time, It’s now safe to disconnect your USB cable. That’s it! 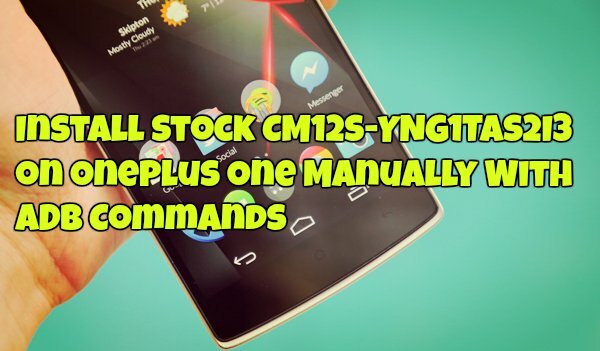 Now your phone is running on the stock version of CM12S-YNG1TAS2I3 Android Lollipop.